You are here: Home / Headlines / Cell Sourcing - Cell Culture Technologies / mRNA reprogramming system, fastest & safest! Early reprogramming methods utilized retroviral (including lentiviral) vectors to introduce reprogramming-associated transcription factors to the target cells. While these pioneering experiments provided a fundamental proof-of-concept, these vectors require the integration of heritable viral DNA sequence into the host cell’s genome. The integration site of the provirus is highly random and can interfere with normal cellular processes in unpredictable ways. Since then, the focus has been on developing reprogramming technologies that reduce or eliminate the risk of insertional mutagenesis and the biohazards associated with viral vectors, particularly those involved with oncogene delivery. 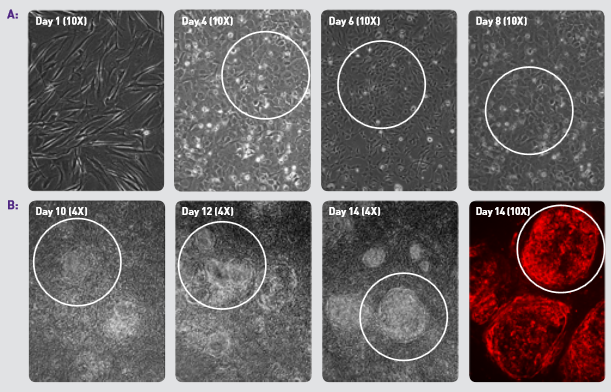 A human iPS cell colony at Day 18 generated using the mRNA Reprogramming System. In efforts to generate iPS cells without genomic contamination (footprint-free), other methods have been explored including; adenoviruses, plasmid DNA, recombinant proteins, and small molecules. Although these systems do not require genomic transformations of the target cells during reprogramming, they are difficult to reproduce due to extremely low reprogramming efficiency. Further developments of exogenous transcription factor-based reprogramming utilize Sendai virus (DNA-free) and transfection, or electroporation of episomal DNA. These methods are an improvement, however they still carry significant risk of either insertional mutagenesis or prolonged viral retention and persistent ectopic factor expression, and therefore necessitate screening of derived iPS cell clones. The development of mRNA reprogramming technology provides a fast, safe and efficient means of generating clinical-grade human iPS cells from somatic tissue (3,4). Reprogramming human cells with mRNA factors produces reprogramming efficiency greater than 1% without the use of virus or DNA vectors (5). Today, mRNA-based reprogramming has proven to be the only non-viral, non-integrating method for reliable, safe and efficient generation of clinically relevant human iPS cell lines. Comparison of standard reprogramming methodologies. RNA proves to be the most efficient and safest reprogramming method as compared to all viral- and DNA-based methods. Benefits of using the Stemgent mRNA Reprogramming System compared to other reprogramming methods. 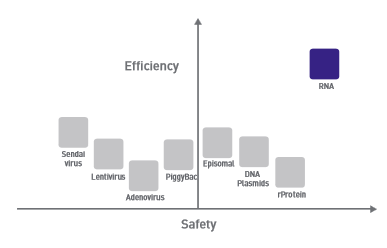 mRNA provides efficiency greater than 1% compared to other methods, which yield reprogramming efficiencies varying from 0.00001-0.01%. mRNA reprogramming does not require multi-step passaging or screening for virus or genomic integration once new colonies are derived. Ongoing research has demonstrated a role for microRNAs in the maintenance and retention of pluripotency for both embryonic stem (ES) cells and iPS cells (6,7). MicroRNAs are endogenous, small, non-coding RNAs (approximately 21 nucleotides) that target and down-regulate tens or even hundreds of mRNAs by blocking gene expression via translational repression or degradation of functionally transcribed mRNAs. In 2012, two groups demonstrated that delivery of specific microRNA combinations can functionally reprogram human fibroblasts to a pluripotent state in the absence of exogenous reprogramming factor expression (8,9,10). Subsequent efforts to validate this work have failed to demonstrate reproducible and efficient iPS cell colony generation. As a result, internal research at Stemgent-Asterand is focused on the role of microRNAs in cellular reprogramming protocols utilizing mRNA for reprogramming factor delivery. One of the key challenges in transcription factor facilitated reprogramming is efficient penetrance into recalcitrant, slowly-dividing cell populations common in older, diseased patient samples. Through global gene repression, pluripotency associated microRNAs induce self-renewal and proliferative networks, inhibit TLR-induced inflammatory cytokine expression, and promote a mesenchymal to epithelial (MET) transition (11,12). These combined elements support efficient transcript delivery and comprehensively influence the cellular transciptome to facilitate reprogramming, which is particularly advantageous when working with difficult to reprogram patient samples. This work has resulted in the development of a new RNA-based reprogramming method to generate high-quality human iPS cell lines. The microRNA-enhanced mRNA reprogramming system eliminates feeder co-culture during the reprogramming process while incorporating both the Stemgent Stemfect™ RNA Transfection kit (Stemgent Cat. No. 00-0069) and microRNA Booster Kit (Stemgent Cat. No. 00-0073). These modifications to the traditional feeder-based mRNA reprogramming protocol result in faster reprogramming kinetics (fully-reprogrammed iPS cells in as few as 12 days), and improved productivity across patient-derived cell lines when compared to other available reprogramming methods. Time-course images of the generation of human ipS cells using the Stemgent mRNA Reprogramming System show expected morphology of ipS cells. Phase-contrast images taken at 10X (A). Phase-contrast images taken at 4X (B) and on Day 14 fluorescent staining of TRA-1-60 taken at 10X. 1. Takhashi, K., Tanabe, K., Ohnuki, M., Narita, M., Ichisaka, T., Tomoda, K., Yamanaka S. (2007) Induction of pluripotent stem cells from adult human fibroblasts by defined factors. Cell, 131 (5): 861 – 872. 2. Yu, J., Vodyanik, M.A., Smuga-Otto, K., Antosiewicz-Bourget, J., Frane, J.L., Tian, S., Nie, J., Jonsdottir, G.A., Ruotti, V., Stewart, R., Slukvin, I.I., Thomson, J.A. (2007) Induced pluripotent stem cell lines derived from human somatic cells. Science, 318 (5858): 1917 – 1920. 3. Yakubov, E., Rechavi, G., Rozenblatt, S., and Givol, D. (2010) Reprogramming of human fibroblasts to pluripotent stem cells using mRNA of four transcription factors. Biochem Biophys Res Commun. 394: 189 – 193. 4. Warren, L., Manos, P.D., Ahfeldt, T., Loh, Y.H., Li, H., Lau, F., Ebina, W., Mandal, P.K., Smith, Z.D., Meissner, A., Daley, D.Q., Brack, A.S., Collins, J.J., Cowan, C., Schlaeger, T.M., and Rossi, D.J. (2010) Highly efficient reprogramming to pluripotency and directed differentiation of human cells with synthetic modified mRNA. Cell Stem Cell, 7: 618 – 630. 5. Stemgent mRNA Reprogramming System User Manual.. Cambridge, MA: Stemgent-Asterand. 6. Sridharan, R. and Plath, K. (2011) Small RNAs loom Large During Reprogramming. Cell Stem Cell, 8: 599 – 601. 7. Judson, R. L., Babiarz, J. E., Venere, M., and Belloch, R. (2009) Embryonic Stem Cell-Specific microRNAs Promote Induced Pluripotency. Nature Biotechnology 27(5):459-61. 8. Mallanna, S. and Rizzino, A. (2010) Emerging roles of microRNAs in the control of embryonic stem cells and the generation of induced pluripotent stem cells. Dev Biol. 344: 16-25. 9. Anokye-Danso, F., Trivedi, C. M., Juhr, D., Gupta, M., Cui, Z., Tian, Y., Zhang, Y., Yang, W., Gruber, P. J., Epstein, J. A., and Morrisey, E. E. (2011) Highly Efficient miRNA-Mediatd Reprogramming of Mouse and Human Somatic Cells to Pluripotency. Cell Stem Cell. 8 (4): 376 – 388. 10. Miyoshi, N., Ishii, H., Nagano, H., Haraguchi, N., Dewi, D. L., Kano, Y., Nishikawa, S., Tanemura, M., Mimori, K., Tanaka, F., Saito, T., Nishimura, J., Takemasa, I., Mizushima, T., Ikeda, M., Yamamoto. H., Sekimoto, M., Doki, Y., and Mori, M. (2011) Reprogramming of Mouse and Human Cells to Pluripotency Using Mature MicroRNAs. Cell Stem Cell 8: 633 – 638. 11. Liao, B., Bao, X., Liu, L., Feng, S., Zovoilis, Z., Liu, W., Xue, Y., Cai, J., Guo, X., Qin, B., Zhang, R., Wu, J., Lai, L., Teng, M., Niu, L., Zhang, B., Esteban, M. A., Pei, D. (2011) MicroRNA Cluster 302–367 Enhances Somatic Cell Reprogramming by Accelerating a Mesenchymal-to-Epithelial Transition. The Journal of Biological Chemistry, 286, 17359 – 17364.